Help Child Find locate children with disabilities. 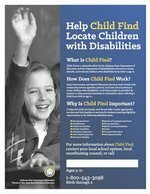 Child Find is a statewide effort by the Alabama State Department of Education and the Department of Rehabilitation Services to locate, identify, and evaluate children with disabilities from birth to age 21. Early Intervention and Special Education Services work closely with community service agencies, parents, and local school systems to locate children with disabilities. A toll free number is provided for parents or other person's interested to in information about referring a child from birth to age 21. Child Find is important because it helps the child, the family, and the provider to plan appropriate services and link families to services for students meeting eligibility requirements. 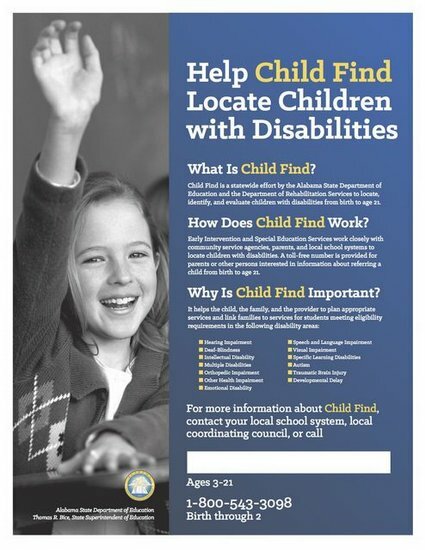 For more information about Child Find, contact your local school system, local coordinating council or call 256-447-7483 ages 3-21 or 1-800-543-3098 Birth through age 2.